One variable linear equations are just what the title says. Equations that have one variable. An equation is where we set one expression to be equal to another. We're going to use x or some other letter to hold the place of some number we don't know the value of - yet. Linear equations are equations where the variables have exponents that equal 1. It is assumed that a variable has an exponent of 1 unless someone actually gives it an exponent. So is the equation E=mc squared a linear equation? Trick question! Sure it is. In that formula the C stands for the speed of light, which is a constant (at least in this formula). 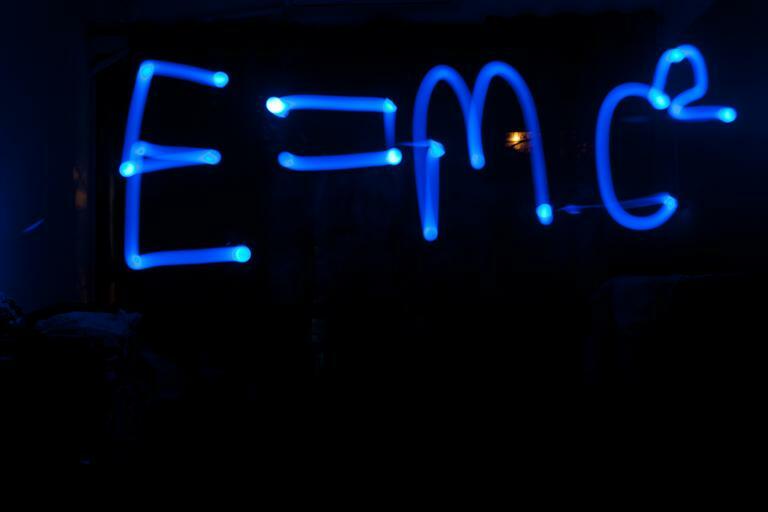 Energy equals Mass times the Speed of Light squared. Einstein just needed a really big number because a very little bit of mass makes a whole lot of energy. The independent variable here is M and the defendant variable is E. C squared would actually be the slope, and the y intercept is zero. Keep reading, as I explain this in What about y = mx + b.
Oh, I should probably say this as well. Linear Equations are equations that graph as straight lines. So, Is There a Trick to Solving One Variable Linear Equations? When solving linear equations, your goal is to get the variable, by itself, on one side of the equal or inequality sign. So, we end up with x= expression. We do this by remembering that whatever we do to one side of the equal sign, we have to do the same thing to the other. Solving a linear equation is just like solving a puzzle. An example of a linear equation would be 3x + 6 = 15 - what would x have to equal for this to be true? Remember, we want to get the x by itself. First, see if there's anything we can add or subtract that will get us closer to our goal. Hopefully, the 6 looks good for this. It's currently be added - so, let's subtract 6 from both sides getting 3x +6 -6 = 15 - 6. On the left side of the equation, the sixes cancel out giving us 3x + 0 or just 3x. So 3x = 15-6. Which simplifies to 3x = 9. Do we need to write all this - no, I'm just trying to be clear about what's happening. Second, see if there's anything we can multiply or divide that will help. Well, if we divide 3x by 3 we'll get 1x or x. And that's a good thing. So, let's do that 3x/3 = 9/3. We end up with x = 3. Let's check it. The original equation was 3x + 6 = 15. Let's put 3 in for the value of x and see if this works. 3(3) +6 = 15 or 9 + 6 = 15 - Looks good to me. Thirdly, or tertiary to all that (I really like the word tertiary) you can do almost anything you want, as long as you do it to both sides of the equation. Typical one variable equations might look like 14/x = 56. there are several good ways to work this problem. You could multiply both sides by x and then divide both sides by 56. But what I would do is invert both sides and make the equation x/14 = 1/56, now multiply both sides by 14 and we get x = 14/56 = 4. Get creative, you can do pretty much anything as long as you do it equally to both sides of the equation. What about y = mx + b? No discussion of linear equations would be complete without at least a mention of y = mx + b. We'll get into this more later when we talk about slope and graphing. Anyway, in that formula, y is called the dependent variable because its value depends on what we let x be. x is the dependent variable and it equals whatever we tell it to equal. In this form, the m is the slope and the b is the y intercept. Slope is the pitch or the slant or whatever. Slope is what you make sure the roof of your house has so the rain and snow slides off. Many school buildings have roofs without slope. Surprise - they eventually leak. The y intercept should probably be called the y intersect. Because, in that formula b is the point where x = 0 and the graphed line intersects the y axis. When I hear y intercept I think of jet fighter plains intercepting enemy fighter planes. Intercept and Intersect pretty much mean the same thing. So, if you have the equation 3x + 6 = y. We would know that the slope of the line would be 3, meaning on a graph for every unit we move to the right in the x direction, we move up 3 spaces in the y direction. and that when x = 0, y = 6 so it crosses the y axis at (0,6). We always list coordinates in (x,y) form. There's dozens of ways to deal with fractions. I mention it here because you're going to need to deal with fractions when working with one variable equations. If you learned one of these methods in 6th or 7th grade, and you like it - great! I may talk about them in another section, or I may not - not sure yet. I've had students get extremely confused by these methods and their only purpose is to show you a cute method that works. I'd rather you understood why something works than learn some cute procedure without really understanding it. If your interested in the butterfly method, you could go to www.moveitmaththesource.com for more information. You should do nothing in math without understanding why you're doing it or why it works. Your goal should not be to pass some test. Your goal should be to understand mathematics. Believe me, you can understand mathematics.